VW Says It Will Retrofit Diesel Cars To Fix Test-Cheating Module : The Two-Way As early as 2007, Volkswagen was reportedly warned by the contractor that supplied the now-infamous engine management software that it would be illegal to sell cars with deceptive settings. German carmaker Volkswagen says it has a plan to refit diesel cars that will make them comply with emissions standards. 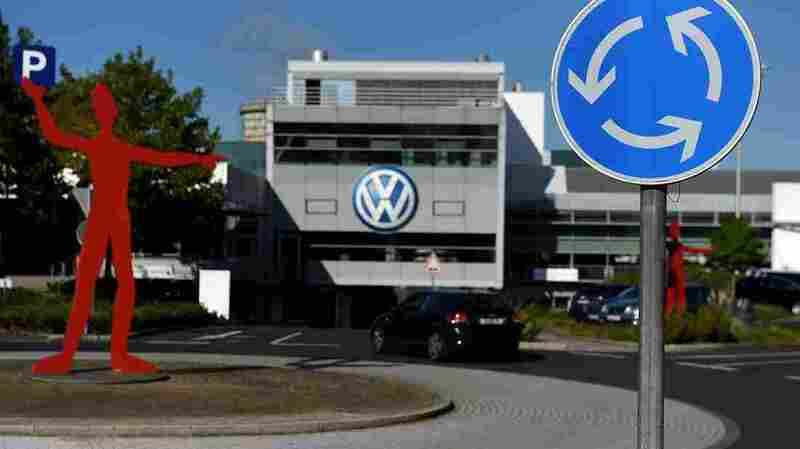 Here, the entrance to a VW branch in Duesseldorf, Germany, is seen on Monday. Under fire for misleading governments and customers about its diesel cars' emissions, Volkswagen has a plan to recall millions of vehicles so it can fix the problem. The company has said it sold 11 million cars worldwide that use software to limit emissions only during official testing. The news comes from a large internal meeting at the company led by Matthias Mueller, who took over as VW's leader last week after Martin Winterkorn's resignation. "New CEO Matthias Mueller said the automaker had drawn up a 'comprehensive' refit plan to be submitted to regulators aimed at ensuring its diesel models complied with emissions standards. "VW will ask customers 'in the next few days' to have diesel models equipped with manipulated software refitted and brief authorities on technical fixes in October, Mueller told a closed-door gathering of about 1,000 top managers at the company's Wolfsburg headquarters in Germany on Monday." Over the weekend, reports emerged in Germany that add more detail to the story of how Volkswagen cars went to market with software that detects when government-mandated tests are being conducted — and only turns on emissions controls during that time. As early as 2007, VW was warned by contractor Bosch, which supplied the now-infamous engine management software, that it would be illegal to sell cars with settings that could elude emissions tests, according to the newspaper Bild am Sonntag. Bosch had originally created the software for use in testing, the paper says. And later, in 2011, a VW technician also aired warnings about the diesel emissions, according to Frankfurter Allgemeine. Volkswagen had a further warning in May 2014, when the U.S. Environmental Protection Agency told the company about irregular emissions test results. As we've reported, Volkswagen only produced a limited response to the EPA — until the carmaker was told that its next-year models might fail to get certified for American markets. The EPA cited VW's response when it announced the violations of the Clean Air Act and ordered the carmaker to recall 482,000 Audi and VW vehicles in the U.S. It remains unclear how widely those early emissions warnings circulated; as Car and Driver notes, VW brand chief Wolfgang Bernhard and engineer Rudolf Krebs, who initially developed the diesel engine in 2005, moved on to other jobs in 2007, and they've denied knowing about the issue. Citing a (subscriber-only) Automotive News story, Car and Driver reports that after Bernhard and Krebs "realized that an AdBlue urea exhaust-treatment system would be needed to meet U.S. emissions standards," finance executives at Volkswagen found that solution to be too expensive, at more than $350 per vehicle. After the emissions scandal turned into an international recall last week, Volkswagen said it was setting aside more than $7 billion to deal with the problem. The company also faces the possibility of more than $17 billion in potential fines, in the U.S. alone.